Calluna has small scale-leaves (less than 2–3 mm long) borne in opposite and decussate pairs, whereas those of Erica are generally larger and in whorls of 3-4, sometimes 5. The flowers emerge in late summer; in wild plants these are normally mauve, but white-flowered plants also occur occasionally. They are terminal in racemes with sepal-like bracts at the base with a superior ovary, the fruit a capsule. Unlike Erica, Calluna sometimes sports double flowers. Calluna is sometimes referred to as Summer (or Autumn) heather to distinguish it from winter or spring flowering species of Erica. Calluna is native to Europe, Iceland, the Faroe Islands, and the Azores. It has been introduced into many other places worldwide with suitable climates, including North America, Australia, New Zealand and the Falkland Islands. 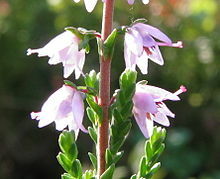 Despised until the 19th century for its associations with the most rugged rural poverty, heather's growth in popularity may be paralleled with the vogue for alpine plants. It is a very popular ornamental plant in gardens and for landscaping, in lime-free areas where it will thrive, but has defeated many a gardener on less acid soil. There are many named cultivars, selected for variation in flower colour and for different foliage colour and growing habits. Cultivars with ornamental foliage are usually selected for reddish and golden leaf colour. A few forms can be silvery grey. Many of the ornamental foliage forms change colour with the onset of winter weather, usually increasing in intensity of colour. Some forms are grown for distinctive young spring foliage. Cultivars include ‘Beoley Crimson’ (Crimson red), ‘Boskoop’ (light purple), ‘Cuprea’ (copper), 'Firefly' (deep mauve),‘Long White’ (white). Heather is an important food source for various sheep and deer which can graze the tips of the plants when snow covers low-growing vegetation. Willow grouse and red grouse feed on the young shoots and seeds of this plant. Both adult and larva of the heather beetle (Lochmaea suturalis) feed on it, and can cause extensive mortality in some instances. The larvae of a number of Lepidoptera species also feed on the plant, notably the small emperor moth Saturnia pavonia. Formerly heather was used to dye wool yellow and to tan leather. With malt, heather is an ingredient in gruit, a mixture of flavourings used in the brewing of heather-beer during the Middle Ages before the use of hops. Thomas Pennant wrote in A Tour in Scotland (1769) that on the Scottish island of Islay "ale is frequently made of the young tops of heath, mixing two thirds of that plant with one of malt, sometimes adding hops". From time immemorial heather has been used for making besoms, a practice recorded in "Buy Broom Buzzems" a song probably written by William Purvis (Blind Willie) (1752–1832) from Newcastle-upon-Tyne, England. Heather honey is a highly valued product in moorland and heathland areas, with many beehives being moved there in late summer. Not always as valued as it is today, it was dismissed as mel improbum by Dioscurides. Heather honey has a characteristic strong taste, and an unusual texture, for it is thixotropic, being a jelly until stirred, when it becomes a syrup like other honey, but then sets again to a jelly. This makes the extraction of the honey from the comb difficult, and it is therefore often sold as comb honey. White heather is regarded in Scotland as being lucky, a tradition brought from Balmoral to England by Queen Victoria and sprigs of it are often sold as a charm and worked into bridal bouquets. Heather stalks are used by a small industry in Scotland as a raw material for sentimental jewellery. The stalks are stripped of bark, dyed in bright colours and then compressed with resin. Calluna vulgaris herb has been used in the traditional Austrian medicine internally as tea for treatment of disorders of the kidneys and urinary tract. The plant was introduced to New Zealand and has become an invasive weed in some areas, notably the Tongariro National Park in the North Island and the Wilderness Reserve (Te Anau) in the South Island, overgrowing native plants. Heather beetles have been released to stop the heather, with preliminary trials successful to date. 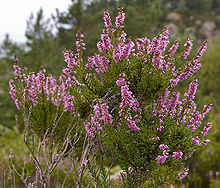 Purple heather is one of the two national flowers of Norway. ^ Matveev, Vladimir. "Ling – definition from". Biology-Online.org. Retrieved 2010-01-27. ^ "In favorable conditions, old plants can grow to the height of a man, and have hidden many a fugitive," remarks Alice M. Coats, British Shrubs and Their Histories (1964) 1992, s.v. "Calluna". ^ Clive Stace, (2010) New Flora of the British Isles, 3rd edition. Cambridge University Press. ^ Anderberg, Arne. "Calluna vulgaris (L.) Hull". Naturhistoriska riksmuseet, Stockholm. ^ "Countries (or multi-country features) with distribution records for Calluna vulgaris in the Global Invasive Species Database". Invasive Species Specialist Group (ISSG) of the IUCN Species Survival Commission. ^ "Most people today consider it the best of all honeys, but this was not always so." Alice M. Coats, Garden Shrubs and Their Histories (1964) 1992, s.v. "Calluna". ^ Translated as "noughty honey" by William Turner: noted in Coats (1964) 1992. ^ "The Folklore of Heather". Tree for Life. Archived from the original on 2008-04-25. Retrieved 2013-04-08. ^ Vogl, S; Picker, P; Mihaly-Bison, J; Fakhrudin, N; Atanasov, A. G.; Heiss, E. H.; Wawrosch, C; Reznicek, G; Dirsch, V. M.; Saukel, J; Kopp, B (2013). "Ethnopharmacological in vitro studies on Austria's folk medicine--an unexplored lore in vitro anti-inflammatory activities of 71 Austrian traditional herbal drugs". Journal of Ethnopharmacology. 149 (3): 750–71. doi:10.1016/j.jep.2013.06.007. PMC 3791396. PMID 23770053. ^ "Cabweb.org - de beste bron van informatie over cabweb.Deze website is te koop!". Pest.cabweb.org. Archived from the original on 2011-07-25. Retrieved 2010-01-27. ^ Mahbubul, A.F. Jalal; David J. Read; E. Haslam (1982). Phenolic composition and its seasonal variation in Calluna vulgaris. Phytochemistry. 21. pp. 1397–1401. doi:10.1016/0031-9422(82)80150-7.